Are you Ready for a Glass Recycling Adventure? Captain Cullet and the Little Gob o' Glass need YOUR help. They want you to help them recycle glass bottles and jars. Of course, you may be wondering, "Who are these characters and what are they?" Read on to meet this glass-recyclin' duo and be sure to tune in to their two feature animations! 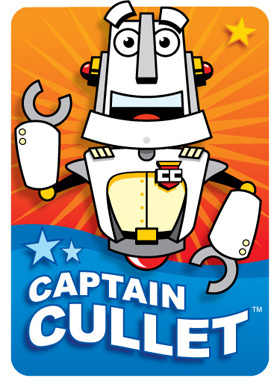 Captain Cullet wants the world around us to be clean for you and your families. To help make the Earth a better place to live, you can start right now by recycling your used soda bottles and pickle jars. Sounds easy, doesn't it? And if we can help Captain Cullet and Li'l Gob tell others why it's important, our future will look even brighter! Explore this site and you'll find out why glass is a good choice for packaging food & drinks and exactly how recycling glass containers helps everyone. Favorite Quote: "Together we can help save the Planet Earth!" The Little Gob o' Glass is a drop of molten glass. He is very HOT! That's why he's bright orange. 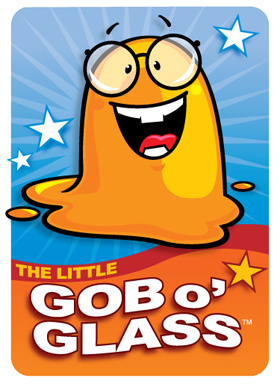 Li'l Gob will be molded into a glass container and cooled off. Once he becomes a bottle or jar, he can help keep our food & drinks fresh! Favorite Quote: "Recycle glass, woo-hoooo!!"